Practical yet stylish, canvas backpacks give you the freedom to travel and explore, or even just get through day to day activities at school or work. Their durability offers up reliability, and the vintage canvas style appeals to most. They are one of the true pieces of apparel that can still boast exquisite craftsmanship and are able to incorporate both a rustic and sophisticated look. Canvas backpacks are probably the most versatile travel accessory that one can have. They can be used as a daily bag, shoved into an overhead compartment for long distance trips, or they can be trusted to keep your laptop or tablets safe during commutes. Finding a canvas backpack that is durable and versatile is the first step – the color, style, and brand can come next. A canvas backpack can really help to make life on the go a little bit easier. You don’t want to have to worry about the bag tearing, not fitting all your gear or not conforming to the spaces and activities you put it through. Today, you might use it to carry your laptop to the coffee shop, tomorrow you might need it to hike through the wilderness – the possibilities are nearly endless! Canvas is known for being durable. It is a plain woven fabric that has been used throughout many trades and times. It has been used to make sails, canvas roofing, oil painting backings, tents, and backpacks. Historically it was made from hemp but has been modernized now – containing cotton, linen and polyvinyl chloride. Through its history and many uses, one thing remains – it is one of the most durable fabrics around. You want to make sure that the canvas backpack you are buying is going to last. There are some considerations you need to keep in mind when buying a canvas backpack – material, size, versatility, and padding are all factors that can impact the convenience and lifespan of the canvas backpack and your contents that it carries. All these factors play a big role in deciding how long the canvas backpack will last, how durable it is, how comfortable it will be to carry and how it looks. To save you going through the impressive amount of canvas backpacks on the market, we’ve put together a comprehensive list containing the ten best canvas backpacks of 2019. While they all carry that traditional canvas backpack appearance, they are each tailored in a way that will suit different people’s needs. I’m sure you’ll find just what you’re looking for here! If you are looking for a durable, reliable and versatile canvas backpack, the Gootium Canvas Backpack is by far one of the better choices out there. The bag is 100 percent pure cotton and has thick metal buckles and fastenings. The material has been washed in such a way to give the backpack a vintage canvas look, and has been cured to have a softer feel than usual canvas. The shape of the bag is adaptable to the contents and can be folded away easily when not in use. It is a true-to-canvas backpack that will last many adventures. The backpack features many different compartments. There are several pockets available for storage, but most importantly for some, the interior storage compartment can accommodate a 17-inch laptop. The large front pocket is fastened using a secure belt, and the two side pockets are easily and securely closed as well. The backpack also has a secure zippered compartment for more valuable items such as a cell phone or wallet. The vintage canvas backpack has a generous amount of space – it is 17.7 x 13.5 x 8 inches. The bag also comes in a smaller size: 15 x 12 x 8 inches. The Gootium Canvas Backpack is a great vintage styled backpack. The old-school buckles along with the touches of leather and metal give it a rustic, rugged feel. Furthermore, this is complemented by the clean and even stitching. The craftsmanship of the bag can be seen and felt through its strength and material. It is durable enough to be used daily and has compartments for different belongings, a safe zippered compartment and an interior space for a laptop. It should fill all the needs a canvas backpack could fill, and it will do so with reliability and style. The colors available are Black, Khaki, Army Green and Coffee – more neutral colors to add to the vintage feel. A more modern take on a vintage canvas backpack, the Bluboon soft canvas and genuine leather backpack is an ideal twist on old and new. It can be used daily, for work, school and travel. It has been designed to cater across different niches, giving users enough space and reliability. 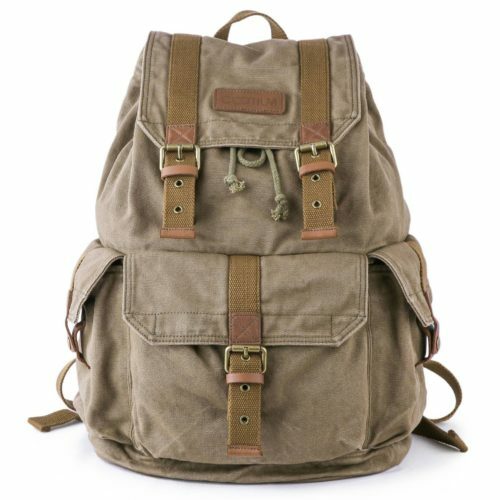 The vintage canvas backpack comes in a wide variety of colors with many color variations to choose from. Its clean, frill-free look is appealing for more minimalistic users. There are multiple handy compartments built into the backpack. The main interior compartment is closed using a drawstring and also further securely shut using a magnet press. The magnet button press makes for easy access, and easy closing, but is still strong enough to keep contents safe inside. The interior section is not padded but with a padded laptop sleeve, it could fit a 15.6-inch laptop securely. There is a Velcro strap to keep the laptop in place and protected. Other compartments inside the bag keep important items such as wallets and keys out of sight and sheltered. The outside compartments close with strong zips that have styled leather pulls and are securely stitched for extra reassurance and reliability. Soft yet strong, the cotton canvas is comfortable and light to carry around but still strong enough to not rip or tear. The added genuine leather contributes to the vintage feel and helps strengthen the bag further. The leather pulls on the zips are sturdy and barely wear after constant use. The leather straps are strong enough to keep the bag closed securely when buckled. The inside of the vintage canvas backpack is larger than most of its competitors. With a capacity of 22.6L, it can hold many different items. The actual size of the bag measures 17.8 x 12 x 6.5 inches. 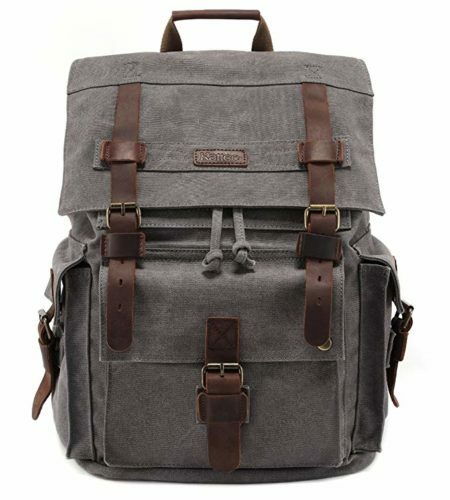 Overall the Bluboon vintage canvas backpack is a good-looking, reliable canvas backpack. It has the old vintage feel but is also available in trendy colors. The shoulder straps are padded and adjustable, so you are able to tailor them to suit you. The interior of the bag is fairly large and can accommodate for a 15.6″ laptop. There are then also other interior and exterior compartments which can hold different items and keep them safe. The strong zips and secure stitching make the bag durable and a good place to keep your valuables when traveling. 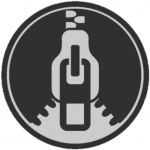 Bluboon is one of the more trusted brands and is always a good buy with customers. You know you are going to get a quality, well-crafted bag from them. The KaukkoTravel Laptop backpack is as reliable as they come. With a 600-denier rating, you know the fabric is strong enough to not rip or tear under a little bit of pressure. The bag is made primarily as a canvas laptop backpack but can accommodate for traveling, work or school. It is one of the higher-end laptop bags and is sure to last as a favorite among users. Its rustic, simple design is exactly what a canvas backpack needs to look like and it even comes with a small travel pouch that matches the main bag. This extra pouch can keep smaller valuable items like keys and money safe inside the main compartment. The canvas material is soft and comfortable, but still sturdy enough for outdoor use. The 600-denier polyester and cotton canvas is eco-friendly, perfect for the green-conscious. The imported canvas is high-quality, durable and comes with a 6-month warranty. The bag comes in various shades of greens, browns, khaki, and red, giving the canvas a more natural, rustic look. The leather and canvas are strong enough to keep the contents safe, but still soft enough to mold to what it is carrying. The canvas backpack is fairly large and measures 18.5 x 11.8 x 6.3 inches. The total capacity is 22.4L. The main laptop compartment can accommodate a 15.6-inch laptop, while the outside compartment can hold up to 18 inches. The contoured shoulder straps can be adjusted to suit your height and physique and are padded for extra comfort. The back side is made with protective air mesh and padding which helps to distribute the weight of the bag evenly, cutting out any excess strain on the shoulders. The main compartment is easily secured using a drawstring tie and the inside of the bag has nylon lining which is red and white striped. The compartments are all closed using a magnetic strap and pins while the front pocket can be secured with a hidden zipper. The key clip will help keep your car or house keys safe and easy to find, and the two side pockets can be used to store a water bottle and coffee or tea on either side. The Kaukko Canvas Backpack will do well as an everyday bag. The backpack’s casual yet multi-purpose design will fit into any schedule. Laptops, books, snacks, keys, and wallets can all be carried around safely and securely in the canvas backpack and the extra matching wallet pouch adds that extra little bit of convenience. Traditional canvas meets vintage canvas in this beautifully crafted, original P.KU VDSL canvas backpack. The classic rucksack is made using cotton canvas and genuine cows leather, both materials that are durable and comfortable. It is a simple yet purposeful backpack that will accommodate most outings and activities in style. The P.KU VDSL canvas backpack has a maximum capacity of 29L. The size of the bag is 18 x 12.6 x 7.9 inches. A 17-inch laptop can easily fit into the main compartment, and there are many other pockets and areas to fit other essential daily items such as notebooks, wallets, and keys. There is one front zipper pocket, two zippered pockets on the sides and one rear zipper pocket. Aside from the main laptop compartment on the interior of the bag, there are two interior cell phone compartments, 2 interior zipper compartments, and a credential pocket. The smaller compartments help keep items organized and save you scrounging through the bottom of your bag to find your keys. The adjustable and padded shoulder straps make the bag easy and comfortable to carry throughout the day. It has compartments to house everything you might need to get through a day of traveling, at school or at work. There are enough compartments to keep your life organized. Both practical and subtly stylish, both men and women can boast the beautifully crafted backpack. On top of its daily use function, the bag can even be used on hikes or when mountaineering. The many compartments and durable fabric make it the perfect companion for outdoor adventure. 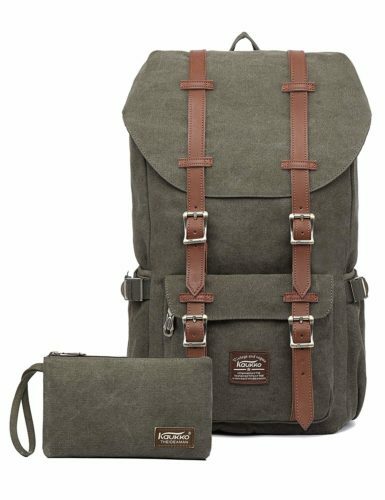 This is one of the most practical and stylish men’s canvas backpacks on the market. It is simple and to the point, exactly what most men want in almost everything they buy. It has all the bells and whistles, without seeming over the top or too delicate. The straight lines and European influence give the bag the classicism, elegance, and durability the brand base themselves on. The KatteeMens Leather Backpack is made from a high-density cotton canvas. This means that the material is durable and strong enough to see you through daily routines and out of the ordinary adventures, but is still soft and comfortable enough to be used frequently. The added accents of genuine cows leather give the rucksack an authentic appeal. The leather belt straps securely close the bag and are strong enough to weather against resistance and constant use. The metal buckles add to the vintage feel but also serve a security purpose by keeping the bag safely closed. The KatteeMens Backpack has a large 15-inch main pocket that is the perfect size for housing an iPad Air, textbooks, and magazines. There is also a large interior pocket that fits a 17-inch laptop. The padded interior will keep the laptop secure and safe. Pockets are secured using magnetic buttons and decorative buckles made from genuine cows leather. There are more than enough compartments on the outside and inside of the backpack to house everything you need when out and about. For someone who prefers simple yet classic backpacks, this is probably the right choice. It is available in different colors, but very earthy, neutral tones. The cows leather straps and fold over canvas give it a very traditional, outdoor look but it definitely serves for many different purposes, including work and school. It can easily be used to travel the outdoors and then to the office and will fit in easily with any outfit or style. 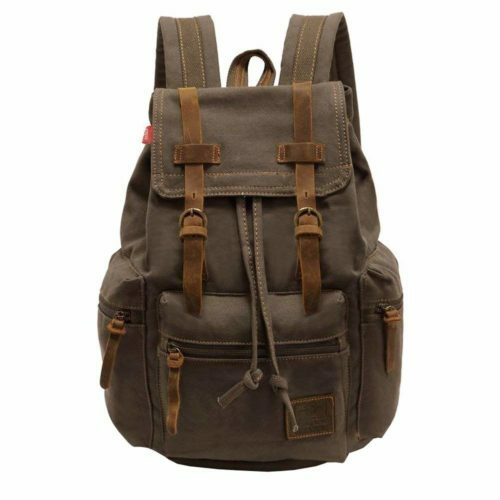 This waxed canvas backpack is a classic, and will really serve as a go-to for everyday use. The subtly dated look with an outdoor touch is perfect for those needing a bag that can switch between adventure and necessity. The leather fold-over flap protects the inside of the bag from harsher conditions and also adds to the rustic look. ‘Crazy horse’ leather, oil wax canvas and 100% cotton liner make this bag durable and soft. Crazy Horse Leather (also sometimes called saddle leather) is not made from actual horsehide, but rather standard cowhide leather. It is made by applying a specific wax which makes it waterproof and durable, it also gives it that lovely vintage/ antique look. The high-rated 600D canvas is also waterproof to raindrops and small splashes and is resistant to damage. The leather straps keep the bag securely closed and the brass buckles bulk up the protection of your belonging. The larger sized backpack is 12.9 x 17 x 5.07 inches. It is a decently sized bag for everyday use and has enough room for many items, but will not look over-stuffed. The SUVOM Vintage Canvas Backpack was designed to be user-friendly. The thick cotton shoulder straps contain memory foam that adapts to your unique physique and they are adjustable to match your height. They make the bag comfortable enough to carry around for extended periods, perfect for school or hiking. The drawstring closure keeps belongings safely contained and is easy to open and close. 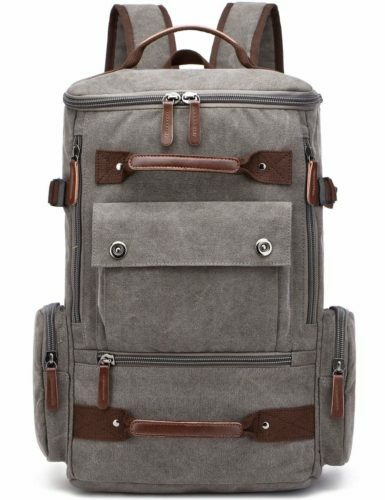 The exterior of the backpack has two side pockets with metal buttons that can house water bottles or umbrellas, there is a front zipper pocket that is easy to access, and there is a large interior compartment to house a 15.6-inch laptop, two slip pockets and one wall zipper compartment to keep important items. Subtle color combinations are available, but all keep to the aged vintage waxed canvas look. Neutral and earthy tones allow the bag to be paired with any outfit and will do well outdoors. The SUVOM Vintage Canvas Backpack is versatility and style wrapped into one useful backpack. The multiple pockets and compartments are held closed by strong magnetic snaps. The leather and waxed canvas all add to the aged, rugged look that this bag very successfully achieves all while being versatile and very useful. It is one of the few waxed canvas backpacks that will last a good amount of use, and which is so successfully crafted to be durable and reliable. From the office to school, the forest to your favorite hiking trail, the Hynes Eagle Vintage Canvas Backpack is there to cater for each environment. Its softened edges with clean lines and its canvas drawstring backpack look, it is a modern backpack yet true to traditional cotton canvas bags. The faded cotton canvas is as good as new but looks as tastefully vintage as possible. The backpack is considered large, with a 21L capacity. The dimensions measure 11.8 x 17.3 x 6.3 inches. It only weighs 2 pounds and has plenty of room for everyday essentials. The adjustable shoulder straps extend from 19.7 to 39.4 inches, so they are very customizable to different body sizes and heights. The top grab handle is 3.7 inches allowing for an easy grab and go. The backpack is multi-purpose with a flat top and lace-up closure which is underneath the panel exterior. There is a front utility pouch with a zipper in the front ad two side zippers on the outside that allow for quick access to smaller items. On the back of the bag, there is a vertically zipped pocket that keeps valuable items hidden and safe, close to your body. The interior of the backpack has a big main compartment and a few smaller interior compartments to fulfill different needs. The soft padded interior can fit a laptop and tablet up to 13.3 inches. Adjustable shoulder straps allow you to customize the dimensions of the bag to suit your height and physique, making it a comfortable carry. The padded back panel also helps the bag fit comfortably, making sure that the weight is distributed evenly. The Hynes Eagle Vintage Canvas Backpack is great for on the go use, at the office, school, running errands or even adventuring outdoors. The only downfall is that the main compartment only fits in laptops and tablets up to 13.3 inches. This is great for some, but others might opt for a bag that allows room for larger laptops. The bag comes in various tones of black, brown, khaki, reds and yellows – something to suit each taste while keeping in line with the rustic feel. It is a fun, versatile bag that will be used often and is durable enough to last through everyday use. The more rugged option, the Gearonic TM Vintage Canvas Backpack. A mix between a duffle bag and a canvas backpack, it has enough space and compartments to go from camping to the office, and everywhere in-between. It is durable, reliable and practical, while still looking really decent. 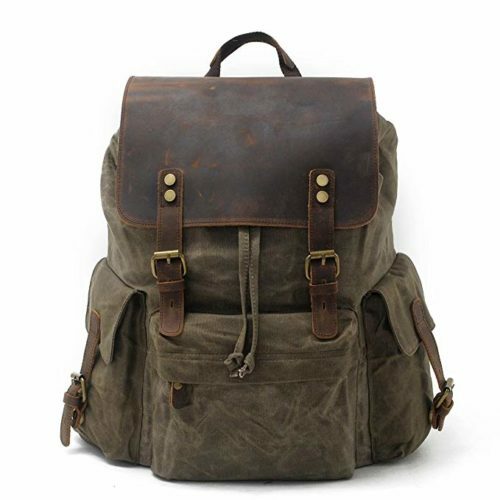 It stays true to the traditional canvas rucksack look and it more masculine in appearance. A high-denier rating means this bag is strong and durable. The fabric isn’t prone to tears and scratches and can be trusted when pushed to the limit. The premium quality canvas and PU leather keeps your belongings safe but still give off the vintage canvas look. The classic fold-over flap is adorned with brass accents and these accents along with the leather give it a rugged-classy look. 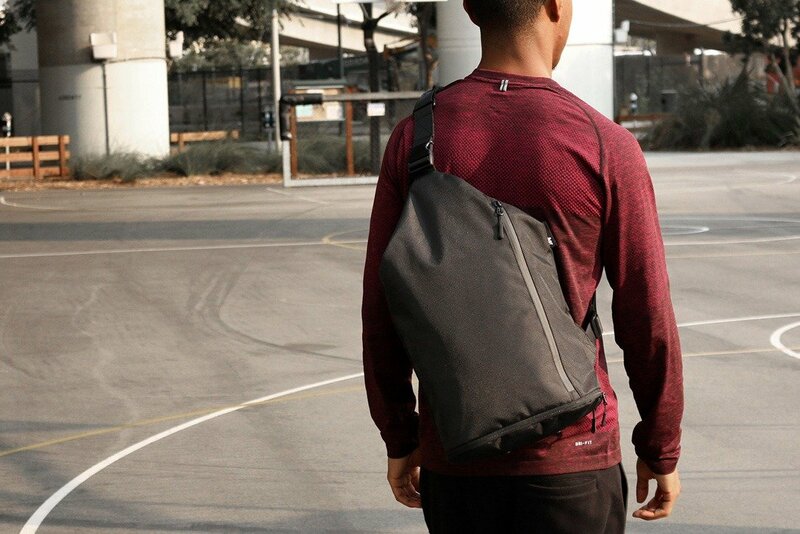 The duffel backpack is large enough for everyday use and overnight travel. It measures 18 x 16 x 9 inches. The interior compartment is spacious enough to house a laptop and other essentials that need packing. The backpack has various useful pockets and spaces: two side pockets, one front pocket and one large compartment with two smaller compartments inside. The large main compartment closes using a traditional drawstring that is then closed in using a fold over flap. The other two compartments on the inside can hold important items such as cell phones, keys, water bottles and other essentials. The adjustable shoulder straps mean that the bag can be personalized to your height and physique, so there shouldn’t be any strain when carrying the bag around. Often if a bag has the incorrect length shoulder straps, back pain can occur. The Gearonic Canvas Backpack will fit into an outdoor lifestyle that mixes between work and play. 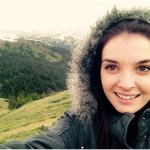 It can easily transition between the wilderness and the office. The multiple compartments are all secured properly and there are enough compartments to fit in essentials, without the bag being covered by too many useless pockets. Color variations of grey, brown, yellow and khaki are available, but all come with the classic brown straps. It is a bag that could be great for the outdoors, but it is also sophisticated enough to be carried into a boardroom. A very versatile backpack, the Gingood Canvas Backpack can be used by almost anyone in any environment. It is durable and reliable, and casual enough to travel with you whenever you need it. It has the classic canvas backpack look but has been finished off with clean lines and a simple, country design. The backpack isn’t as large as some other competitors in the field but is a perfect size for those needing something a little more compact. It has a maximum capacity of 19L and its measurements are 15.7 x 13.8 x 6.7 inches. 100% durable cotton canvas covers the bag and the straps are leather with some metal details. Two side pockets and the front pocket are zipped in securely to keep contents safe. The interior features a laptop space for up to 14 inches and there are 5 interior pockets for all the smaller items. The laptop compartment is padded so that your laptop will be kept safe from bumps and scratches. The material and design allow this backpack to transition from hiking to school and there is a pocket for every need. While the overall capacity isn’t necessarily large, there is enough compartment space to properly organize belongings. The backpack is only available in grey, but it is a great color that caters to different tastes, different environments, styles and is unisex. For everyday use at school or the office, it is the perfect bag. The size isn’t as big as some of the others but it could suit more petite users perfectly. Some people prefer a smaller bag and don’t need a larger backpack for just a few items. The bag maintains its shape fairly well and can be packed away easily if need be. If you already have a steady overnight bag and are just looking for a canvas backpack to run daily errands with, this is the one for you. The Aidonger Vintage Canvas School Bag is definitely a looker. Its clean lines, boxy shape and leather accents keep it looking sophisticated and casual at the same time. The exterior compartments are easily accessible and make using the bag on-the-go easy. The leather accents add to the European feel and keep the bag looking classy. The large backpack measures in at 18 x 11.8 x 6.7 inches and has a capacity of 25L. It is a more rigid bag so there isn’t much give or take with the sizing. 16oz canvas makes this bag very durable and sturdy, but it is also soft and comfortable – and it is even eco-friendly. Many pockets mean that there is space for nearly everything to be held in the bag. Six pockets on the outside, one laptop compartment that fits a laptop up to 17 inches and two open pockets on the inside are all secured properly with a metal pop clip or secure zips. The good quality zippers will last as long as the material and are sturdy enough not to break after a few uses. The S-shaped adjustable shoulder straps let you customize the bag to your body height and help fight off any back or shoulder pain from carrying heavier objects around or using the bag too often. The bag boasts a large capacity and can be used in a professional environment, at school or doing any type of physical activity indoors and outdoors. It has a one year warranty which speaks to the quality and security of the bag and the materials. 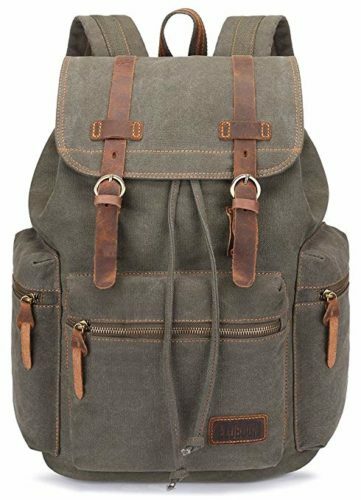 Colors available are greys, blues, khaki and brown – all which help the bag stick to the clean, rugged yet sophisticated look. Canvas backpacks can come in many shapes and styles. Vintage canvas backpacks, canvas drawstring backpacks, and even waxed canvas backpacks – all of these need to tick the same boxes to ensure that you are buying a worthwhile and reliable bag that can be used often. You want your canvas backpack to suit your needs, and also your style. While canvas backpacks can all serve similar purposes, they can differ widely in quality and reliability. You want to be sure that the money you are spending on your backpack has been well spent. Take the time to read about the different factors that can make or break a bag. Save yourself the worry and buy a bag that will last and that will be comfortable to carry. The fabric/material used in canvas backpacks is cotton canvas. It is heavy weight woven cotton that is made from synthetic and natural materials. The cotton canvas material can be waterproof and lightweight and can have a high denier rating. A denier rating is the density of the woven material; the higher the denier rating, the more durable the material. A reliable backpack should have a denier rating of 400 and up. Anything below this won’t last long at all and will tear easily. Cotton canvas is a suitable material for a backpack that is in use daily and is even one of the best materials to use when hiking. The material is strong, reliable and soft, perfect for regular use. Before you can decide what size canvas backpack you need, you will need to know exactly what you are using the bag for and what you will be packing away in it. You also need to take your body size into consideration – a petite person will look a bit off with one of the larger canvas backpacks. You want your bag to suit your torso length and have a good tight hug on your hips. The right backpack will have most of its weight distributed to the hips. This takes pressure off of your shoulders and is a good way to tell if it is the right backpack for you. Measure your torso from the bottom of your neck to the base of your back. This measurement should be able to help you choose a size. XS & S backpacks fit torsos up to 18″. M backpacks fit 18″ – 20″ torsos. 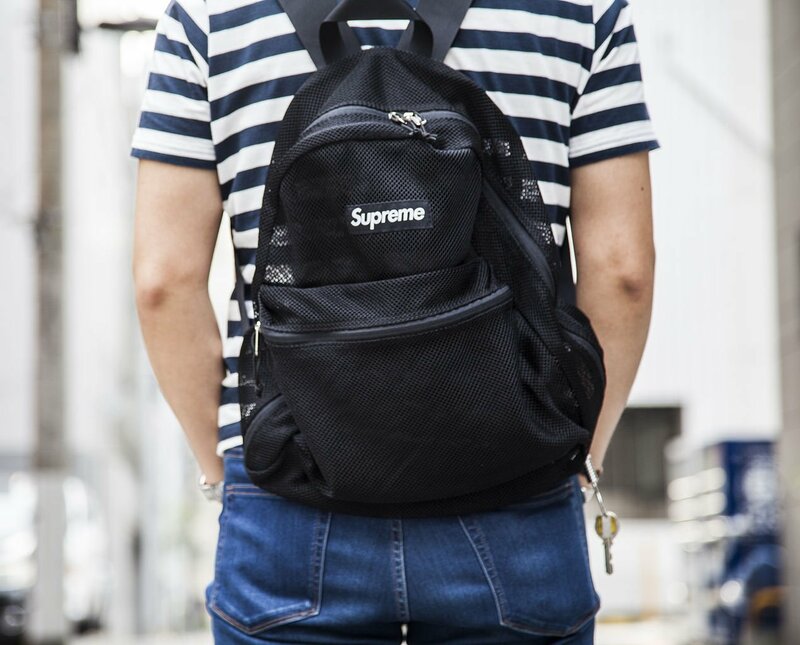 L backpacks fit torsos 20″ and above. An inappropriately sized backpack will cause back pain and make for a very uncomfortable carry. The right size backpack will make a huge difference when performing daily activities while carrying your backpack around. Backpacks come in many sizes – take the time to find out the right size for you. Durability is probably one of the more important factors to consider. Your canvas backpack should be lightweight, but it needs to be strong and durable. The cotton canvas needs to have a high denier rating to be able to hold heavy loads and not tear easily. YKK-grade zippers will keep contents safe, and shouldn’t split or break easily. People usually get rid of backpacks because they break, so there really is no reason to buy a backpack if it isn’t durable and reliable – it will be a massive waste of money. Make sure that the material, straps, and zips are double stitched and that you don’t overload your bag with heavy items. There is no point buying a backpack if you aren’t going to use it due to it being uncomfortable. Back pain is dreadful, and the incorrect backpack can actually cause lasting back problems. Make sure it is comfortable! Shoulder straps and padding are super important. The shoulder straps should be adjustable to match your body size and they should be padded to avoid cutting into your shoulders. Padded backs also help the backpack sit comfortably against your body, and good backpacks come with padded hip belts that further distribute weight to the hips instead of the shoulders. More weight on the hips means you will be able to carry more for longer. It is worth your while to read up on the best ways to use backpacks to avoid any back pain. Cotton canvas is somewhat waterproof, which should keep your contents safe if you get stuck in a sudden downpour. It won’t protect the contents from full submersion in water, but you should be able to survive a quick light drizzle. The inside padding needs to be significant enough to protect the contents of the bag, but not too excessive that it takes up most of the space. Compartments used to house laptops and tablet should be fairly padded to avoid any damage, and they should also offer straps to keep the devices in place. You want your items and belongings to be safe if you accidentally drop your bag or knock it against something. Depending on your needs, the compartments in backpacks vary. Some come with multiple compartments and pockets and some are bare with just one big space for items. How you like your backpacks is a personal taste and necessity changes. Multiple compartments mean you can easily find your items and store them away, but some people don’t have the patience to do this. A front pocket is great for keeping your keys and wallet, items that you use often and need quick access to at times. Most backpacks come with an elasticized side pocket that can hold water bottles. This is great for during the day at school or work or even out hiking, and it means you won’t face any accidental spills inside your bag, potentially destroying all your other items. Zip – Most commonly used on the outside pockets of canvas backpacks. If it is a reliable metal zip, it should be secure enough to keep contents safe. Zips are also easy to use and if there are two handles on the zipper, you can lock your contents inside. Magnetic buttons – Often used on the larger compartments of canvas backpacks to secure down the large front flaps. Magnetic buttons are fairly easy to open and close but they aren’t as secure as other closing options. Drawstring – Proper canvas backpacks usually feature a drawstring closing the main compartment. It is an easy-to-use method and helps keep all of the contents of the bag inside the bag. A drawstring also lets the bag shape itself to the contents when closing, instead of being rigid like a zip. Buckle – Buckling up compartments can be quite finicky and not very time-friendly, but they really do add to the authenticity of a traditional canvas bag. Usually, buckles are used as a secondary closure on a canvas bag, and the compartments are often first secured with a zip or magnetic buckle. The buckles are usually a vintage brass or metal and have leather straps. A good quality canvas backpack will have fastenings that are secure and reliable. A good way to find out if there are any issues with the fastenings used on a bag is to read the customer reviews – the zips, buttons, and drawstrings are often the first tell sign of a cheaply made bag. At school, at work or while on a hike, you want to be sure the contents of your bag are sad and not being strewn around while you walk. 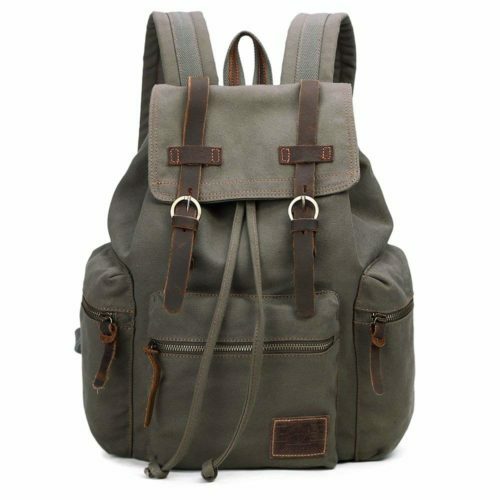 Canvas backpacks usually come in more grey and khaki earthy tones. A black canvas backpack can be the best accessory that fits in with any outfit and any situation, but life tends to be a little more colorful sometimes. Some brands have canvas backpacks in a multitude of colors, tones and color combinations. You can choose your bag based on your preference and even have a bag to match different outfits. Some are more extreme, with popping bright canvas colors, while others stay true to the earthier tones of blues, reds, and greens. If you are looking for a canvas and leather backpack, the color combinations open up even more. 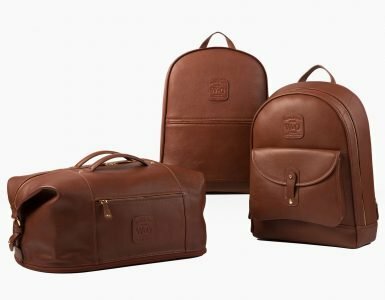 The browns of the leather play against the soft cotton canvas to create a very traditional yet modern looking backpack. As with most things in life, you get what you pay for. There are exceptions here and there but it is always a good idea to spend a little bit extra to ensure that you are receiving a quality item. You want to buy a backpack that is durable, well stitched and strong enough to tote around every day. You won’t get this quality from a factory-line bag that is assembled in 5 minutes. Check out the brand of the bag you are looking at buying, do some research and have a look at reviews of the same item before spending the money. It is also a good idea to check the warranty. Usually, a well-crafted bag will have a minimum of a 6-month warranty. This way you can tell that the manufacturer has confidence in their product, and you have a backup plan should the bag break soon after buying it. Buying from a trusted name brand is sometimes worth that little bit extra that you pay, but there are a few brands that have exquisite craftsmanship but aren’t quite well known yet. It will be worth your money to get to know more about the brand you are buying and spend some time finding out what their after-sales is like as well. You don’t want to be stuck with a bag you can’t return because nobody is picking up the phone to help you. Finding the right canvas backpack is really important. It will help you store your items easily, have easy access to what you need, and be able to carry everything you need around with you comfortably and in style. 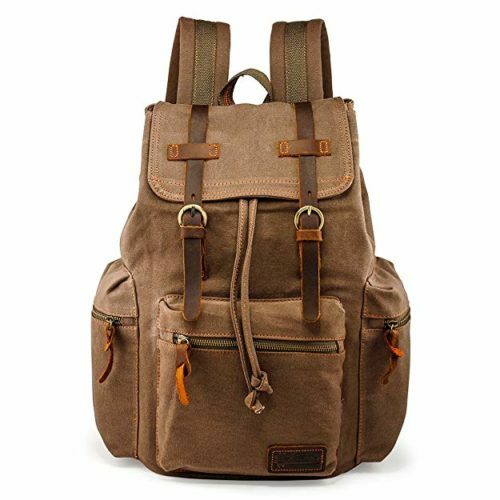 Make sure that the canvas backpack you choose is durable and strong, you don’t want to spend money on one that will need to be replaced because it tears easily. Choose a backpack that will be able to transition between vastly different environments. Having one bag that can go between the office and the outdoors, the subway and overhead luggage is such a time saver, and you won’t have to repack your items into a different bag every time you go somewhere new. Canvas backpacks are famous for being versatile. Their rustic and classy design helps them fit into each environment, and they tune in perfectly to a rugged or sophisticated style. Your laptop will be kept safe and your hiking maps will be protected from the outside weather. A good canvas backpack will be the travel companion you know you need, and with a little bit of research, you will be able to find the one that suits you and your lifestyle perfectly.